This small village of just 250 inhabitants relies mostly on tourism during the summer months for its survival. Some 300,000 visitors pass through this village between May and September. The village is home to the Seven Sisters Waterfall, which is a Unesco World Heritage Site. The weather was absolutely beautiful with plenty of sunshine, which everyone was ready for. 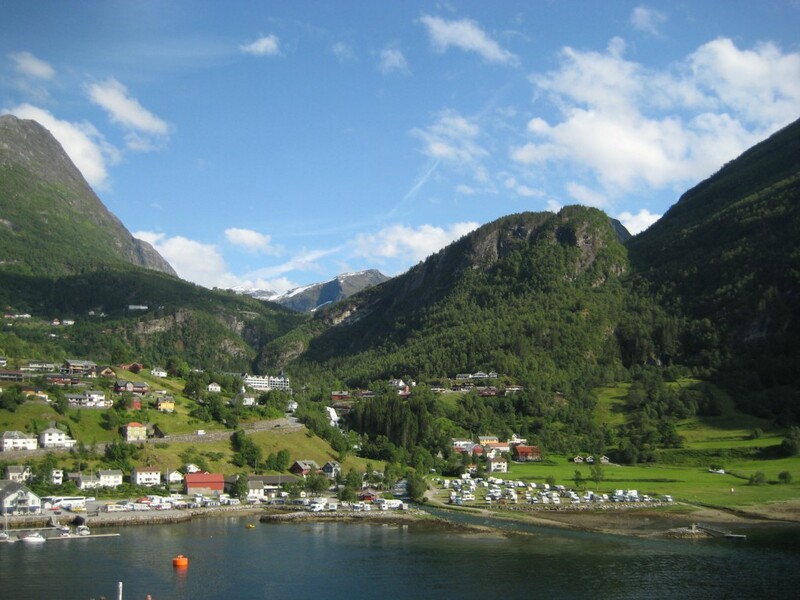 The village is very charming with a few hotels and a large camping ground at the waters edge. There is a huge river with many waterfalls cascading right through the middle of the town. They have recently built a staircase through town along the edge of the river for visitors to get an up-close look at the waterfalls. 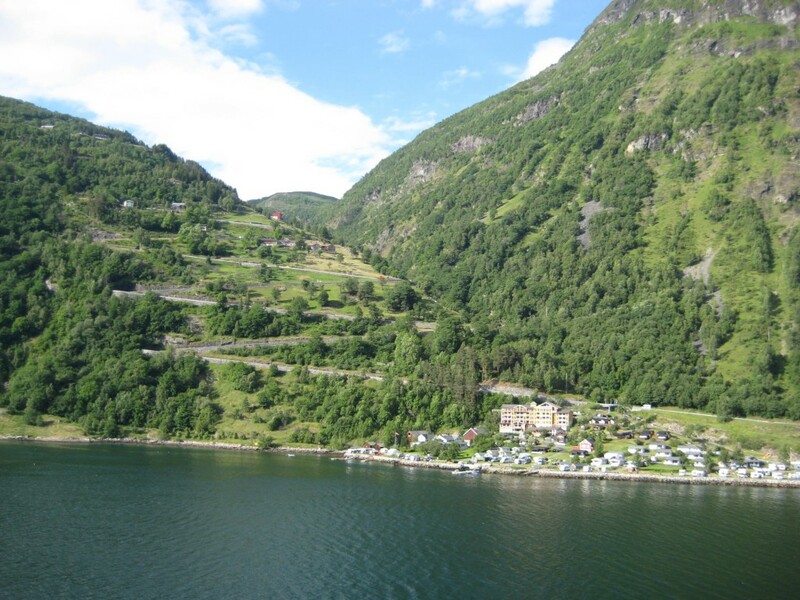 The setting at the end of the fjord with high mountain walls surrounding the village is quite spectacular. It is no wonder that the town welcomes more than 140 cruise ships a year to this beautiful spot. Our tour on this day took us on a scenic drive up into the mountains where we saw many fruit tree farms, lakes and waterfalls. The landscape at the lower elevation is lush and green with trees while the higher elevations are almost barren from the high winds they have in this area. Some of the homes that were built at the higher elevation had cables securing the roof to the rocky hillside to keep it from being blown from its foundation. We stopped at an outlook on the top of Mt. 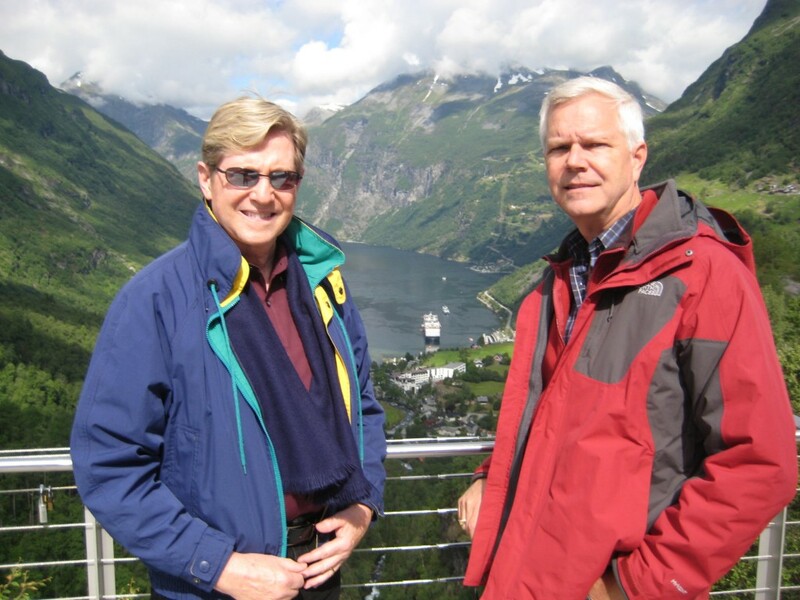 Dalsnibba (4,911 feet in elevation) where we could see all the way down the mountain to the town at the edge of the Gierangerfjord. It had snowed within the last couple of days so there was fresh snow on the ground and the temperature was cold. Along the way we saw sheep and goats that are raised to produce cheese. After driving back down the mountain and into town we headed up the only other road out of town that is called the Eagle Road. The eagle road climbs quickly with a number of hairpin turns. While on our way up we found that someone who was coming down the mountain in a motorhome has gone through a concrete barrier at one of the turns and gone down the embankment a short way before being stopped by a large tree. Luckily, everyone was able to walk away from the overturned vehicle. Emergency vehicles and a helicopter came to rescue. From a lookout along the Eagle Road we are able to get a look at the famous De Syv Sostre (the Seven Sisters) waterfall. The waterfall is named this because there are seven different falls clustered together. Across the fjord from the seven sisters waterfall is another very large waterfall called the Suitor or Whiskey Bottle because of its unique shape, which resembles a whiskey bottle. The evening’s entertainment was an acrobatic variety show by Olympic gymnast Lance Ringnald. Lance is a very engaging person although his act was a bit lacking in content. He told a few jokes, showed some movie clips of himself, did a bit of juggling, played the piano and sang a song. He still has an incredibly fit body at 44. Another one of our group is Eldon (nickname: Eldita), originally from Regina, Saskcatuan, Canada, but is living in Ft. Lauderdale, Florida. He recently left his accounting position and is looking for another. He has several options to consider and doesn’t seem too worried about finding another one. He is almost 50 and is always impeccably dressed and is a fun, engaging person. He is traveling alone and spends lots of time in the casino. Eldon enjoys the shows onboard also. Dale and Thom are currently living in Princeton, New Jersey. Dale is PhD working for Bristol Meyers and Tim was a banker and is now a retired teacher. Dale spends lots of time in the spa and Tom shops. Tom had an altercation with another passenger while in line to get his VAT back. The lady thought he was cutting in line (he was not) and hit him in the face and he fell to the floor. Security was called, but not one staff asked him if he was OK….guess because he was the man. We are sorry that happened…..physical altercations are not good under any circumstances. Others we have been are Elsie, from Oakland. She is travelling with Dan, from Berkeley. Both met in a bereavement group at home as they both lost spouses. Dan is usually at the LGBT cocktail party. We convinced Elsie to join us once. They both have Neptune or large balcony suits and we are jealous. There are two Brazilian gals, Marcel and Andresa, on board with family members. They are delightful, but speak little English. They have been together for 22 years and are convinced that Mark is Kent’s father (NOT! )…but they continually tell Kent how “elegant” and serious Mark appears. Other ladies say the same thing. He is a hottie! Two other male couples from Ottawa are also traveling and we have had limited interaction with them. Another single fellow, Doug, from Albany, CA has also joined our group for dinner, but stays pretty well by himself. Some don’t like to “join” we guess.